Looking for a quick and easy dinner idea? This layered chicken enchilada casserole is easy to make and delicious to eat. It’s easy to change up the ingredients to please even the pickiest eaters. With layers or chicken, cheese, corn tortillas, enchilada sauce, and whatever other goodies you want to add it’s a meal the whole family will love. It’s also easy and quick to make, perfect for busy families. The first thing you’ll need to do is to prepare the chicken. I used enchilada flavored chicken I made in my crock pot and then shredded. You could also use your instant pot if you prefer or cook it on the stove. The crock pot was easy as I could just set it and forget it. It’s great for cooking ahead of time on the weekend for quick and easy weeknight meal preparation. You can also buy pre-shredded chicken at stores like sprouts or use a rotisseries chicken from the store and shred up the meat. Then follow the directions below to make your perfect corn tortilla enchilada casserole. We found it easy to make ours in 2 8×6 pyrex dishes. That way we could easily customize them the way we wanted and then simply pop the lid on for easy storage of the leftovers. Use a church key to put two openings in the enchilada sauce can. That way you can easily pour a small amount into your pan. It’s much easier than using a spoon or trying to pour from just an open can. 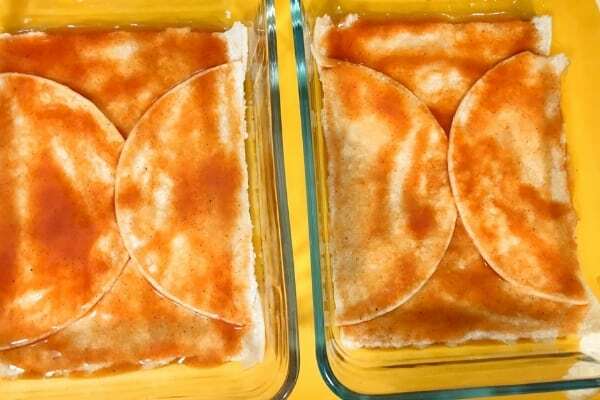 Place a layer of tortillas to cover the entire pan. This took me 2.5 small tortillas. Sprinkle cheese over the top of the chicken. Bake in the oven 15-30 minutes until warmed through. Cooking time will vary based upon pan size and thickness. Top with a dollop of sour cream and enjoy. Calories are a rough estimate and will vary based on the ingredients and amounts you use. Pin it for later and check out my other recipes for Easy Meal for Busy Moms. If you enjoy this please give it a 5 star rating!